"Lompoc Brewing will release its perennial favorite C-sons Greetings and its Bourbon Barrel Aged Old Tavern Rat on Friday, November 11 from 4 to 11 pm at Sidebar, its tasting room located at 3901 N Williams Ave. 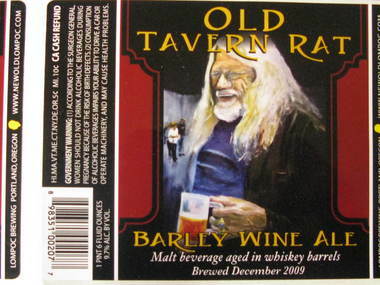 Both beers will be available on draft and in bottles. 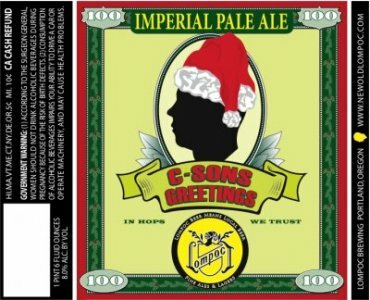 Csons GreetingsOne of the most anticipated beers of the year, C-sons Greetings is a higher alcohol version of Lompoc's popular C-Note Imperial Pale Ale, brewed and dry-hopped with even more of the seven "C" hops - Crystal, Cluster, Cascade, Chinook, Centennial, Columbus and Challenger. It features a deep copper color with a piney, citrusy, floral and resinous aroma. The full hop flavor and endless developing hop presence are balanced by a rich caramel malt finish. This is a big one at 8% ABV. The release party will also feature on tap 2007 Batch 69 Baltic Porter, a porter with hints of chocolate and black licorice that was brewed with a lager yeast for a much cleaner and smoother finish than a traditional porter; Bourbon Barrel Fermented Proletariat Red, fermented in Heaven Hill Bourbon barrels for two months for a malty body with strong oak and vanilla flavors; Bierz Brown, a dark brown beer with a malty body and strong chocolate and roast flavors; and Condor Pale Ale, a crisp and nicely hopped pale ale that's great for quaffing with comrades or enjoying alongside some pub grub. As is the case with all of Lompoc's release parties, there will be complimentary appetizers to nosh while imbibing. Lompoc will release seven more holiday beers at a release party on November 29, and its Hanukkah beer, 8 Malty Nights, on December 14."